Experience the allure of oil painting, and the freedom of a media unlike any other. Oils have been used in some of the greatest paintings in the world from the Great Masters to Modern Artists. Explore a rich and historic medium. Optional still-life is available. 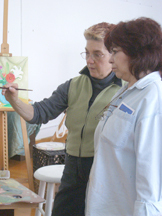 This Weekly Workshop is designed to give you a place and a time to paint with guidance through your projects and ideas from an instructor who is an expert in oil painting. Allison Freedman Weisberg is a studio artist at Women's Studio Center. 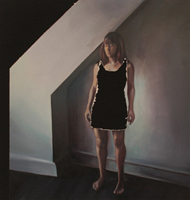 She uses oil paint on clear primed linen, and other media,depicting scenes with a unique,darker side. The above painting is on natural black cotton duck. Click on the photo to see more of her work.